Fast forward a decade or so to when I was a student at UC Berkeley. In 1979, school administrators tried to pave over a portion of the famous People’s Park to create a parking lot — Joni Mitchell could have written Big Yellow Taxi about this (but she didn’t, it was about Hawaii). I was part of a large group of students who assembled there to voice our opposition. I recall a friend of mine saying to a classmate, “What are you doing here? You voted for Reagan,” to which he replied, “Hey, conservatives don’t like tyranny, either!” And then I said, “Well, I’m voting for John Anderson, do I get to stay?” And the three of us — the liberal hippie voting for Jimmy Carter, the conservative, and whatever I was at the time — marched arm in arm through the park. And it worked. From that march, the People’s Park Council was formed, university officials relented, and the parking lot became instead a community gardening area that thrives to this day. These memories are particularly poignant today in the face of near-daily protests and marches against the current administration. It is energizing to watch this collective energy when politics usually inspires little more than apathy and irritation, but it is also dispiriting to observe the acrimony and divisiveness that is its by-product. 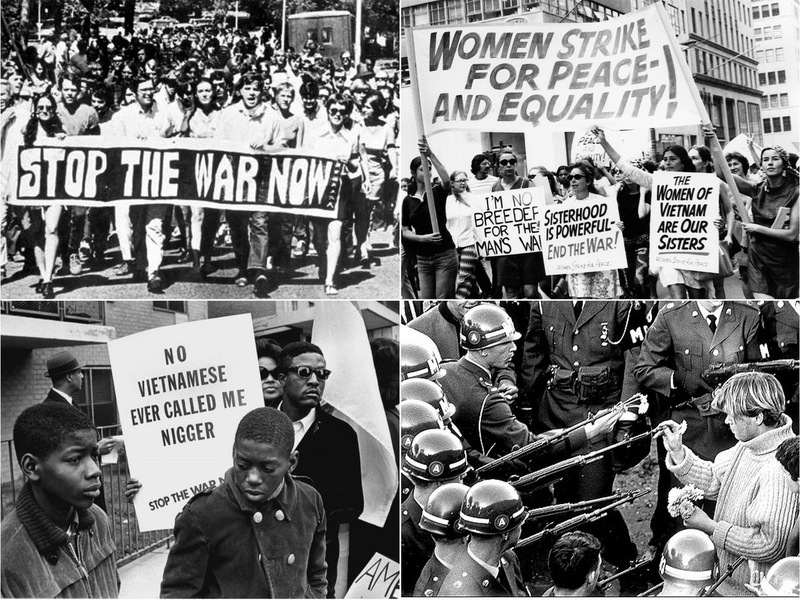 Are protests as useful today as they were in the 60s and 70s? How could they become more effective? And why am I writing about this at a website named BetterPresenting? Protest is a form of public discourse and as such, its effectiveness can be measured, just like a presentation. When viewed this way, are the objectives of today’s protests being met? I think not. Know your audience and what matters to them. Form a focused narrative with sharp points and objectives. Create visuals that complement this message. Deliver with clarity and impact. Who is the audience for most of the protests? Is it the current administration? Those who voted for the president? Or like the Tea Party protests of a decade ago, is the far-left of the Democratic party admonishing its middle to move in its direction? In order to effect real change, the audience would have to be those in the White House, and if so, the recent demonstrations at Berkeley that prevented Milo Yiannopoulos from speaking are not going to move the needle. These protests might have felt like a tremendous victory in the moment, but what did they actually accomplish? In the words of David Frum, in his February article for The Atlantic entitled What Effective Protest Could Look Like, he argues that “[most] demonstrations are exercises in catharsis…their operating principle is self-expression, not persuasion.” Indeed, violence and unrest at these demonstrations actually emboldened the president, who threatened to cut federal funding to the school. Can protests form a focused narrative? Back in the 60s, the most effective ones had a singular message: end the fighting in Vietnam. Millions of people marched on campuses and in cities everywhere, all for that singular purpose. And the slideware of the time was in equal lockstep, with clear banners, messages, and memes. Protesters in the 1960s had plenty to complain about, but their most effective campaigns were laser focused with equally sharp messages. The women’s march on January 21 was powerful and mesmerising, with a lasting resonance. Most, however, are not. Most are unfocused, lacking in clear message, and lacking in supporting visuals. 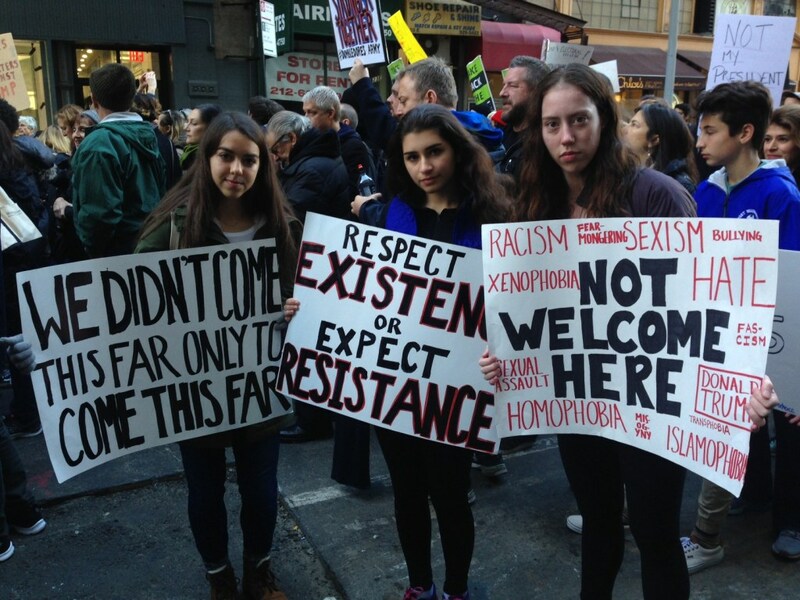 These three young women in New York City deserve kudos for clever writing, but their messages hit you in the head, not in the gut. Lots of words and lots of turns of phrases, but nothing sticky here. Message discipline is hard enough when it is just you speaking to an audience; no wonder it is so elusive among a crowd of demonstrators. And that brings us to the most sensitive topic of all. From all sides of the political spectrum, people disavow the use of violence in public demonstrations, while some accept it as a natural consequence of passion and assemblage. But my mother’s words were prescient back in 1968: one thrown rock would dominate the news, and today’s 24-hour cable news culture only makes that more pronounced. But let’s take the argument further, because again, there’s no news in saying that violence is bad. What about chaos? What about just causing a commotion? What about forcing others to heed your message? I remember well the emergence of the Tea Party in 2008 and 2009. I had just voted for Barack Obama and was grateful for a faction within the Republican party that might help his reelection. All of that infighting and chaos, all of that acrimony directed toward fellow party members; this was good, I thought. These Tea Party rallies are going to buy Obama an additional four years. Now it is the Democrats who are angry and who are protesting, and the degree to which their demonstrations will succeed might depend directly on the degree to which they can bring discipline to their gatherings. And this is irrespective of whether the audience is the administration, whose policies they want to overturn, or citizens, whose votes they want to influence. Chaos and violence will embolden either audience. After a summer of non-stop news coverage of explosive Trump rallies, supporters of the administration take every opportunity to point out that same behavior in today’s protests. And as for the president himself? He might feed off of the chaos even more. Just about every combative move he has made so far has been an “us vs. them” situation. He doesn’t attack policy differences; he attacks the people. The people who are pouring across our borders, the people at Nordstrom, Alec Baldwin and Meryl Streep, and the protesters at Berkeley. If you are trying to win a culture war against someone with clearly drawn identities, you had better have your house in order. Message discipline is important for reasons other than clarity. As was the case in People’s Park in 1979, I found common ground with students of starkly different ideologies because our objective was narrowly defined: save the Park. Why do you think Mothers Against Drunk Driving has been so successful over the years? They can find supporters for that cause in just about every political corner of our country. Organizers would be well-advised to extend this discipline to all signage and to all established forms of acceptable behavior. If opponents of the administration want to be most effective, perhaps they should pick their battles with laser focus. Perhaps they should demonstrate in favor of investigating Michael Flynn’s involvement with the Russian ambassador. Or they could call for a bipartisan study on the effects of building a wall between the U.S. and Mexico. Or question appointees to the National Security Council. The more focused the campaign and the more directed the initiatives, the higher the chance of turning opponents into allies. And that might be the holy grail of all protests. Then there is decorum. This discussion is a bit reminiscent of how I react when NFL players score touchdowns. When they celebrate in the end zone, as if they have just saved a life, cured cancer, or achieved world peace, they implicitly tell me that they don’t really have a healthy perspective or a sense of proportion about their own achievements. The guy who scores, hands the ball to the official, accepts a teammate’s high-five, and walks to the bench — now that’s the guy to fear. He’s telling you that he fully expected to score, that it was no big deal, and that he plans to do it again. Having just watched the hometown team overcome a tremendous deficit to win the Super Bowl, I wonder if there’s more to end zone celebrations. Don’t you think they might contribute to the momentum and stirring up the crowd that comes into play in a game like that, where one team is looking to increase the emotional energy on their side and to increase the sense of impending defeat and perhaps even resignation to the inevitable on the other side before it’s actually inevitable? And isn’t that what we just saw happen in Houston? Kudos. One can only hope that any discussion regarding this article will be on point and not dissolve into the them-vs-us rancor that how seems to permeate most all of our institutions, both private and public. Every day I pray that our Republic will withstand the pressures to pull it apart. A sweet delight to find this article. Thank you for your thoughtful analysis and insight. When I participated in the Women’s March in Canada, as a first time protester, I was struck by how much people thirsted for something to chant, to do, to cheer for – as a way to feel their collective power – together. I had the sense that this dangling anticipation was left unfulfilled. What to do with 8000 people gathered, all at once? And then I thought of Donald Trump, and how he must have felt the same tug. And somehow, I understood how he entered the void and filled it with his own image and self-serving graces. The people were there already, thirsty for the thrill. Your article points out very sound content strategies. I wonder if there an article that talks about how to animate for the greater good – from gut to gut, like you say?